Our dental team is the heart and soul of our practice, and they come to work each day with a singular purpose in mind: to give our patients the easiest, most stress-free dental experience possible. Each member has been hand-selected based on their training, experience, and friendly personality. They’ll be there to make sure you have everything you need for your appointments and no question goes unanswered! Below, you can get to know the friendly faces you’ll meet here at Celebration Family Dental. Jalen has been with our practice since we first opened, having spent four years overall in the dental world. He received his education from the University of North Texas. He loves interacting with patients and helping them organize their dental care with us! Jalen originally hails from Oakland, CA. He is married and has two children, and when he isn’t busy at work, he enjoys parenting and writing. He also has a passion for studying astronomy. Maricela is originally from San Luis Potosi in Mexico. Today, she’s proud to bring four years of experience to our practice! 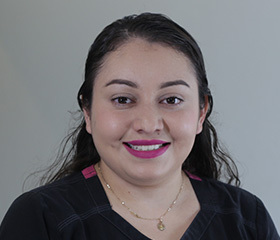 She studied dentistry at Everest College and loves seeing satisfied patients at the end of their treatment. Maricela comes from a family that loves and takes care of one another. She and her husband have a daughter, and she enjoys spending time with them when she isn’t at work. Her other hobbies include listening to music and dancing. She is always there to listen to others, be open to their needs, and give them compassion.